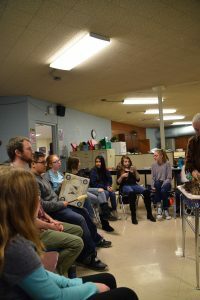 Over the years, the first Leaders In Action (LIA) spring unit has evolved- beginning with global geography, and turning into something that is so much more. 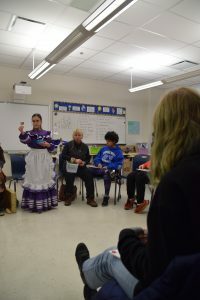 Now, our annual Global Connections unit has grown to include guest speakers, samples of foods from various countries, story-telling, and a take home activity to remember the unit. This year, students were each given their own “LIA World Factbook” (modeled after the annual CIA World Factbook) to take notes, write down stories, and questions that they want to explore further. This unit consists of 6 programs, each highlighting two countries from 6/7 world continents. This year we are excited to be bringing in guests who have lived/worked/volunteered in the Bahamas, France, Greece, Afghanistan, Thailand, Chile, Suriname, Mali, and Comoros. We started off our unit with North America, highlighting the Bahamas and Native American Culture. 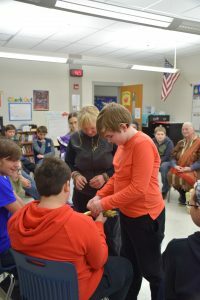 We were excited to welcome members of the Shawnee and Chickasaw nations to share their culture with the students. 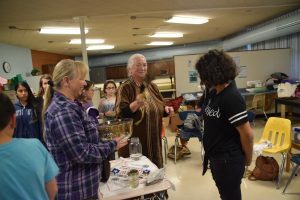 Stories that have been passed down from generation to generation were shared, discussions about names and a naming ceremony were held, and students participated in a water blending ceremony. Students were even able to learn a little bit of Chickasaw language through a fun game of BINGO. The remainder of the unit will see guest speakers who have lived/worked/volunteered in Mali, Comoros, France, Greece, Suriname, Chile, Afghanistan, and Thailand. Guest speakers include former Peace Corps volunteers, retired military, students, and many more. We are thankful to have such a wealth of culture in our community. While we may not be able to take our Leaders all across the world, we are able to bring a little bit of the world to them because of wonderful volunteers.